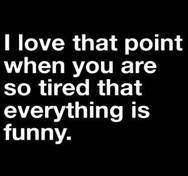 Laughter and tears, both are the result of exhaustion and exasperation. Laughter is good, as there is less cleaning up to do afterwards. Have you ever noticed how fatigued you feel after a full day of frustration, even a full day of hard physical labour less compares. Worry is something that plagues us all and unfortunately probably will until the day we die. There will always be something to fret about, sometimes it can’t be helped, even when we beg ourselves to stop the worry, our pleas go unanswered. Mental exhaustion has been described as being hungover and having the flu all at once, there is no pill to take, nor is there a simple remedy or cure. Rest is the only answer, but who has time for that, not many of us, at least not until we go to bed at night. Exhaustion can overcome us at any time, doing just about anything can put us over the edge, even taking really good care of ourselves can be tiresome. Having to exercise and cook healthy meals, constantly thinking, it all takes time and energy. s our mental conditioning really meant to harm us as much as it tries to! Fatigue is different than being tired, or so they say. When you are tired you know that if you could just get some sleep you would feel better, but fatigue is still there when you wake up and it stays with you all day, the feeling doesn’t go away with rest. Have you have ever felt you were completely empty? Empty enough that if someone were to pick you up and shake you they would feel like they were holding a hollow shell hearing only the sound of all the broken pieces rattling around inside you, if you have ever felt like this know that you are not alone. There are people who will criticize you if you begin to practice self-care, but don’t they know that no one can serve from an empty shell. If you are exhausted because you have just worked your way through a really difficult challenge, tirelessly releasing an old memory that doesn’t serve a purpose in your life any longer, then this kind of exhaustion that you are feeling, is a positive and uplifting kind of tired. Regardless of what makes you feel debilitated and empty, don’t wait until you collapse, stop yourself and pause for a moment and ask your Spirit to give you a helping hand.